Magnetic Particle (careful examination of something) is a nondestructive testing method used for detecting surface and near surface flaws and defects. 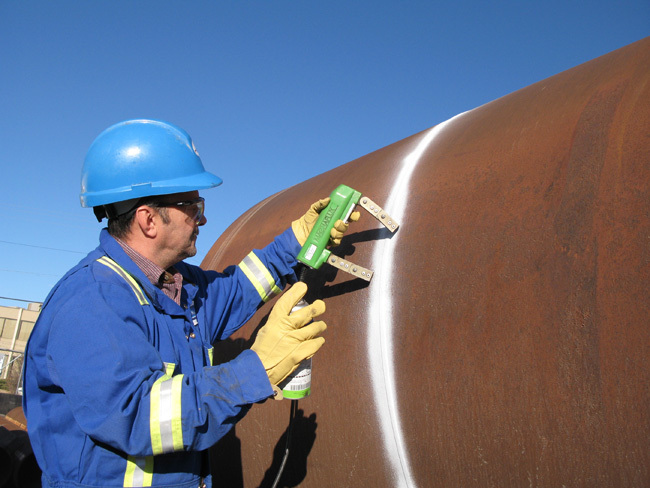 MPI is fast and (compared to other things) easy to apply, and surface preparation is not as critical as it is for other NDT methods. These (features/ qualities/ traits) make MPI one of the most widely used nondestructive testing methods. MPI uses magnetic fields and small magnetic particles almost the same as iron filings to detect flaws in parts/pieces. The only real limitation is that the part being inspected must be made of a ferromagnetic material such as iron, nickel, cobalt, or one of their mixtures (of metals). The method is used to inspect a variety of product forms including castings, forming/creatings, and weldments. The (related to what holds something together and makes it strong) steel, automotive, (related to oil from the ground), power generation, and outer space businesses are a few examples that use magnetic particle (careful examination of something). Underwater (careful examination of something) is another area where magnetic particle (careful examination of something) may be used to test items such as offshore structures and underwater pipelines. 1.MT LEVEL-I Training and certification as per SNT-TC-1A OR CP-189. 2.MT LEVEL-II Training and certification as per SNT-TC-1A OR CP-189..
3.Wide varity of flawed speicmen avaliable for practical training. 4.In house PCN and ASNT NDT L-III who will montor and look after for this program.